The United Nations Children Fund (UNICEF) has donated hearing aids for sixty-three students with impaired hearing in the Trincomalee district. 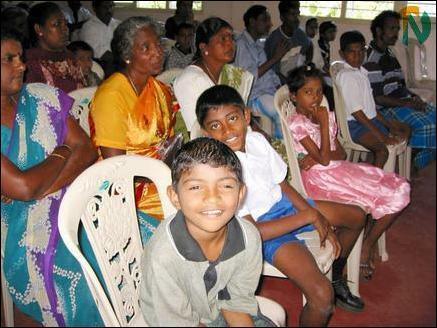 The event where such students were fitted with hearing aids was held Thursday at the office of the Trincomalee education zone, UNICEF sources said. The UNICEF project assistant in Trincomalee, Mr.P.Uthayakumar, was the chief guest at the event and fitted the hearing aid to the first student who came from a school in Nilaveli, 16 km north of Trincomalee town, sources said. Mr. Uthayakumar said most of the students with impaired hearing have been identified from children of Vanni returnees. A pair of hearing aid costs about twenty thousand rupees, education sources said. Hearing of some children had been damaged due to big explosions that had taken place during war period, the survey carried by an international non-governmental agency revealed. Meanwhile, the VIVO (VIctims’ VOice), an international non-profit alliance of alliance of professionals experienced in many fields including psychotraumatology, humanitarian aid, field research, sustainable development and human rights advocacy has carried out a survey of psychosocially affected children in the Vanni region. The survey found that 92 percent of the children have experienced severe traumatizing events, i.e. combat, bombing, shelling, witnessing the death of a loved one, etc. According to the VIVO, 57 percent of the children reported that the effect of these experiences interfere considerably with their life today. A fourth of these children suffer from severe and chronic post-traumatic stress disorder, the report said.